On 31 May Chris Lotz and myself flew to Maputo, Mozambique, to visit Inhaca Island and conduct a bird survey on the island. 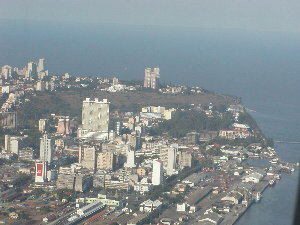 Maputo city centre juts into Maputo Bay, viewed here from the plane before landing. Photo H.D. Oschadleus We arrived in Maputo on Saturday afternoon and would take a ferry to the island the next morning. 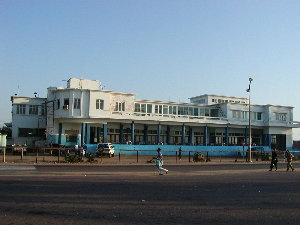 That night we stayed at the Costa do Sol, hotel and restaurant, situated on the northern coastal outskirts of Maputo. 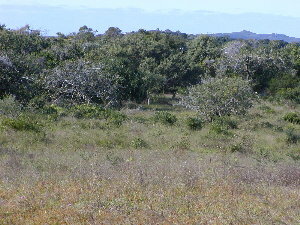 It was a reasonable place to stay and had a wetland area behind the hotel where we could get a taste of Mozambican birding. Photo H.D. Oschadleus A pair of Yellowbilled Storks flew over and landed in this pond. We also saw flocks of Whitefronted Plover, other single waders, and Wiretailed Swallows. Photo H.D. Oschadleus Sunrise over Maputo Bay, from Costa do Sol. 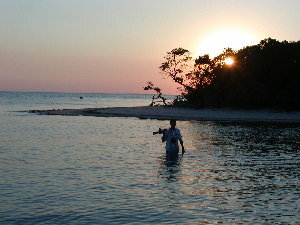 Inhaca Island lies across the bay, 35 km from Maputo, near to where the sun is rising. Photo H.D. Oschadleus The "Norseman" ferry that took us to Inhaca Island. The ferry runs on weekends only (currently). The journey takes about 3 hours. 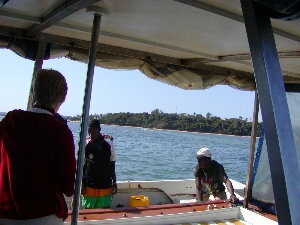 Maputo Bay is very shallow and the ferry stopped some distance from the island. We transferred ourselves and our luggage to a small motorboat. 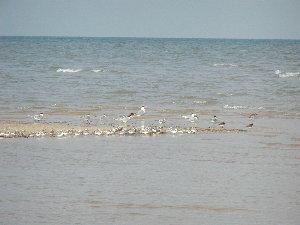 Seabirds seen along the trip were mainly Greyheaded Gulls and Caspian Terns. Shortly before stopping here we were surrounded by a school of Bottlenosed Dolphins. Photo H.D. 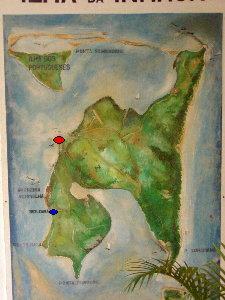 Oschadleus Map of Inhaca Island at the hotel. The red ellipse shows the location of the hotel. The blue ellipse locates the cheaper Marine Biological Research Station (MBS) where we stayed. 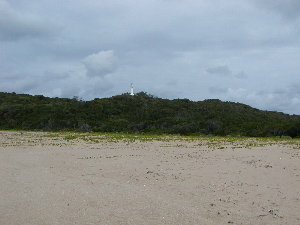 There is a lighthouse on the northern tip of the island. 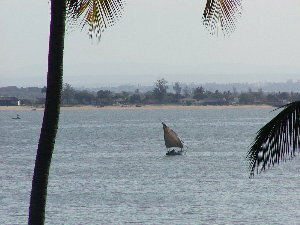 The south-eastern tip is 500 m from the mainland (obscured by a palm pot-plant leaf) - the island is not accessible from this part of the mainland, as it forms part of the Maputo Elephant Reserve. Photo H.D. Oschadleus The colony of Whitebreasted Cormorants breeding at the hotel was active with most nests having incubating adults. 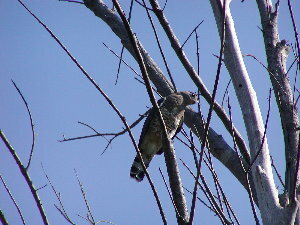 Large chicks were seen on one nest. We counted 43 nests. Photo H.D. Oschadleus The MBS. 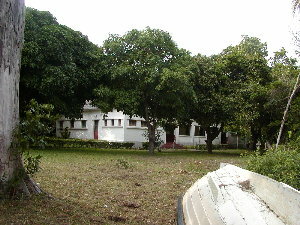 Accomodation is basic with beds and bedding supplied. Cold showers. A kitchen has a gas stove, cutlery and crockery, and a bucket of drinking water. Photo H.D. Oschadleus Tropical paradise. 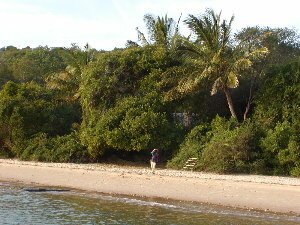 The MBS is behind the line of trees, thus the sea is very accessible. Photo H.D. Oschadleus We had hardly unpacked at the MBS when an inquisitive Southern Banded Snake Eagle perched above us. We had great views for a few minutes of this rare species. Photo H.D. 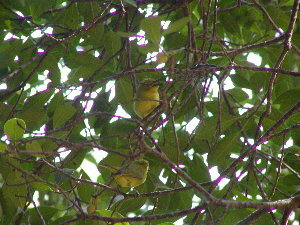 Oschadleus Yellow White-eyes, common around the MBS and other parts of the island. 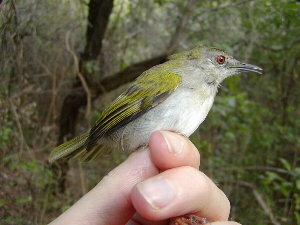 Cape White-eye does not occur on the island. Photo H.D. Oschadleus We went for a short walk around the MBS and soon found White-eared Barbets. 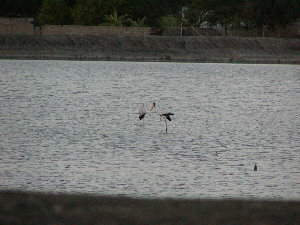 They are common on the mainland and were not recorded on the island by de Boer and Bento (1999). 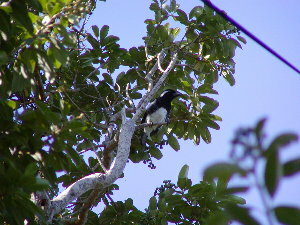 Here one is perched between the leaves to the right of the consipuous twig. Photo H.D. Oschadleus House Crows were seen everywhere on the island. They were introduced and measures are being taken to control their numbers. They have not spread to Maputo (yet). Photo H.D. Oschadleus Caspian Terns roosting at Ponta Raza, a sandspit a little south of the MBS. 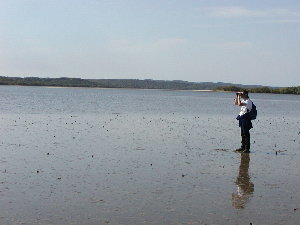 After our walk around the MBS we decided to do our first wader count south of the MBS. 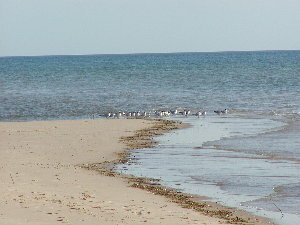 Most common were Caspian Tern, Whitefronted Plovers, Sanderling and Whimbrels. Photo H.D. Oschadleus Crossing a river near Ponta Raza on our return. When we crossed the first time it was less than knee-deep, but on our return the rising tide meant that we had to wade waist-deep. Photo H.D. Oschadleus View of Maputo city at sunset, across Maputo Bay, from the MBS. 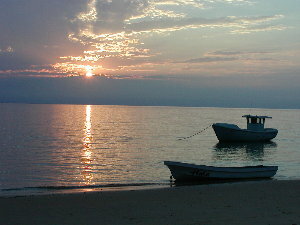 Oh, in the foreground is a fishing boat - fishing is the main livelihood of the villagers living on the island. Photo H.D. Oschadleus The plan for our second day on the island was to do some ringing around the MBS. 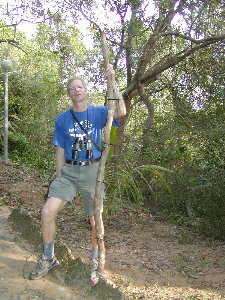 My ringing poles had not arrived at Maputo Airport (they were found several days later!). So I asked the MBS staff to cut some poles from trees. The poles were a little short but worked well. Photo H.D. 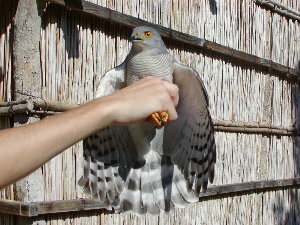 Oschadleus The second bird to be caught was an African Goshawk that had been chasing a passerine. The prey escaped the goshawk and my nets! Other birds ringed were Terrestrial and Yellowbellied Bulbuls, Natal Robin and Spectacled Weaver. Photo H.D. 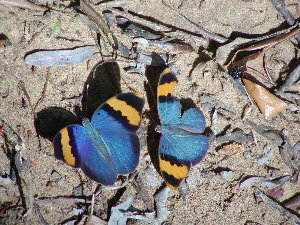 Oschadleus A pair of butterflies flitting about in the forest. 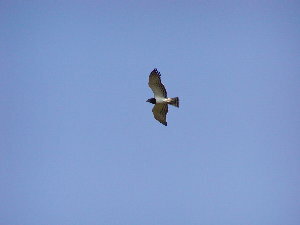 Note the wing of one has been damaged, probably pecked by a bird. Photo H.D. Oschadleus On 3 June we walked around the Saco area, the lagoon between the southern arms of the island. We counted the waders - mainly Little Egret, Greenbacked Heron and Sacred Ibis. Photo H.D. 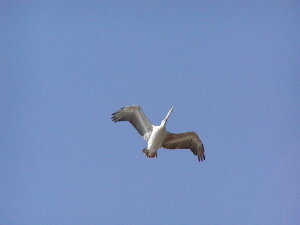 Oschadleus There were a few Pinkbacked Pelicans, this one circled above us allowing it to be photographed. Photo H.D. Oschadleus Mangrove fiddler crabs were common everywhere. 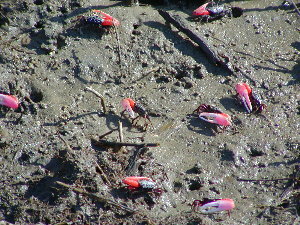 Note one pincer is massive in relation to the rest of the crab and bright red while the other pincer is minute and black. Photo H.D. 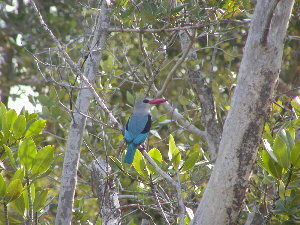 Oschadleus We had greta views of a Mangrove Kingfisher in the mangroves fringing the Saco. Other kingfishers seen on the island included Brownhooded, Pied, and Striped. Photo H.D. 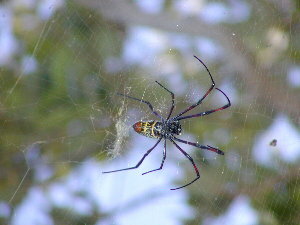 Oschadleus Golden orb-web spider (underside), near the Saco. Photo H.D. Oschadleus On our return from the Saco, we stopped at Nhaquene Swamp (between Saco and MBS). 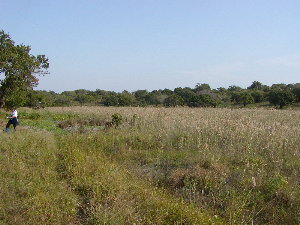 There were Yellow Weavers, one Thickbilled Weaver, and a Redshouldered Widow in the trees around the phragmites swamp. Photo H.D. Oschadleus On 4 June we visited Ngomela forest, on the exposed eastern coast of Inhaca Island (about midway between north and south). We put up some mistnets to catch birds while birding in the area. Photo H.D. Oschadleus We caught a Greenbacked Bleating Warbler, in addition to some Natal Robins. 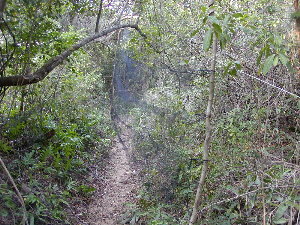 There were many Sombre Bulbuls and other forest species, but in the canopy far above the nets. Photo H.D. Oschadleus On 5 June we put up nets in open habitat between the MBS and Saco, as there were mixed flocks of weavers in the area (Yellow, Masked, Spottedbacked Weavers, and Red Bishops). Unfortunately it was a windy day and the birds did not come near the nets, so none were caught. Photo H.D. Oschadleus While birding near the nets, a Blackbreasted Snake Eagle slowly flew over and was joined a little later by a second bird. Photo H.D. Oschadleus In the afternoon we drove to the north of the island to see the forest around the lighthouse. 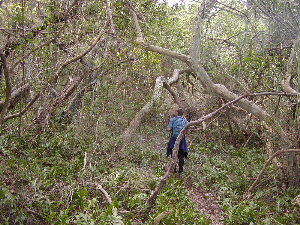 Unfortunately we did not have enough time to do justice to the mature forest, but we kept adding species to our list. 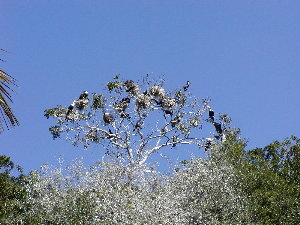 En route we saw Woollynecked Storks. Photo H.D. Oschadleus On 6 June we put up nets at Nhaquene swamp but again we were foiled as the weavers were not present on this day. 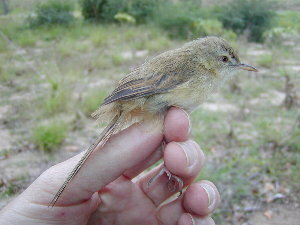 We caught one Tawnyflanked Prinia, but put up the nets too late for Grey Waxbill that we saw on arrival. Photo H.D. Oschadleus In the afternoon we went by boat to visit Ponta Torres (the south-eastern point). 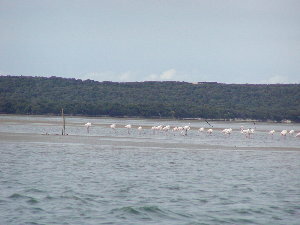 Passing the Saco mouth, we saw flocks of Greater Flamingos. Photo H.D. Oschadleus Ponte Torres (left) is separated by a narrow channel from the mainland (right). 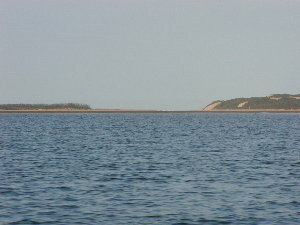 The channel is not visible from this angle. Photo H.D. Oschadleus Birding in the mature forest at Ponte Torres. Photo H.D. 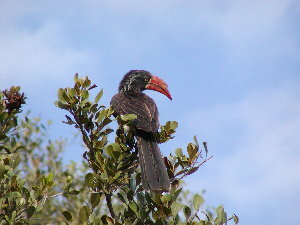 Oschadleus Crowned Hornbill at Ponte Torres. These and Trumpeter Hornbills were seen regularly. Photo H.D. 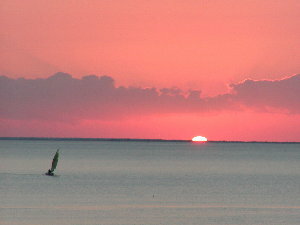 Oschadleus Sunset over Maputo Bay. Most evenings Chris and I sat on the beach at the MBS to watch the sunset, after a hard day's birding. Photo H.D. Oschadleus On two nights Chris tried calling up owls, especially Whitefaced as they are supposed to occur at the MBS. 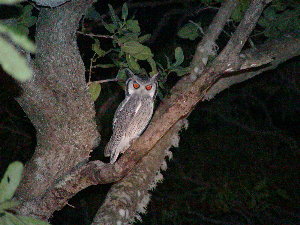 On our last night on the island Chris heard Whitefaced Owl and rushed back to get his CD palyer and spotlight. Photo H.D. Oschadleus On the last day on the island I took an early morning walk on the beach to check for waders and terns. On the spit beyond Ponta Raza were Caspian Terns, Lesser Crested Terns, Turnstone, Sanderling, Whitefronted Plovers, and one Grey Plover. Photo H.D. Oschadleus We packed our bags and left them at the hotel. 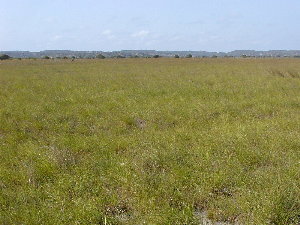 We walked around the grassland and swamp near the airport for our last birding session on the island. 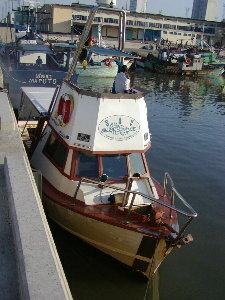 We then took the ferry back to Maputo and spent the night in a hotel in the city center. Photo H.D. Oschadleus On our last day in Maputo we walked along the palm-lined Marginal, a main road next to the coast. 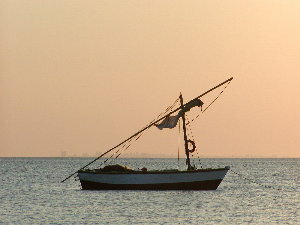 There were lots of fishermen, locals with mere fishing lines and South Africans with more elaborate rods. 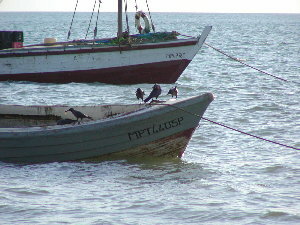 A fishing boat made for my last photogragh of a most memorable birding trip. Prof. Tomas Mulakha, Director of the MBS, kindly gave permission to ring on the island. Thanks to the MBS staff for accommodation, transport and poles during our stay on the island. POSTSCRIPT: I organised the accommodation through the University of the Witwatersrand, and unfortunately no longer have the contact details for the MBS.